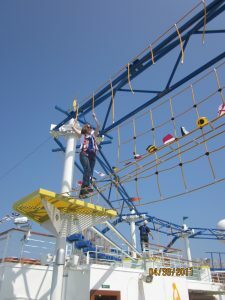 Wilkerson – a former patient at St. Jude Children’s Research Hospital® and now an employee and ambassador of the organization — was among one of hundreds of thrill-seeking guests to try out the new ropes course, a central component to the ship’s expansive SportSquare recreation complex. 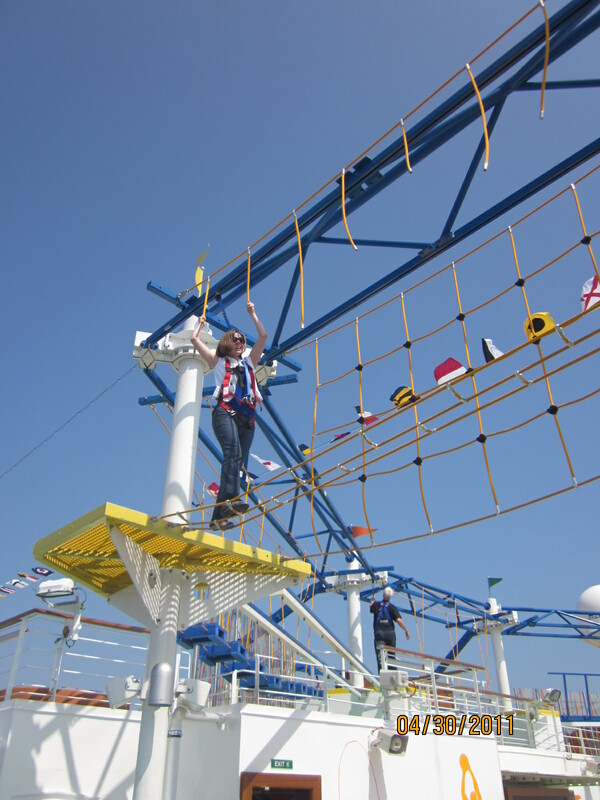 SkyCourse offers two 230-foot tracks with 20 different stations each named after a notable bridge in a Carnival homeport. After donning a safety harness, participants traverse across rope bridges, swinging steps and beams suspended above the top deck, while enjoying breathtaking views to the sea nearly 150 feet below. In addition to SkyCourse, the action-packed open-air facility houses cruising’s first outdoor fitness area, Carnival’s first two-level miniature golf course, a Vita exercise course, and a lighted multi-purpose court for basketball, volleyball and soccer, a jogging track, and ping pong, pool and foosball tables. For those who just want to check out the action, there’s also a bar with a large-screen TV. The choice of Wilkerson as Carnival Magic’s godmother is a tribute to Carnival’s ongoing partnership with St. Jude, one of the world’s premier centers for the research and treatment of pediatric cancer and other catastrophic diseases. Carnival Magic is currently operating seven- to 12-day Mediterranean cruises from Barcelona through October then will reposition to Galveston, Texas, for year-round seven-day Caribbean sailings beginning in November.